DUAL, our keyboard remote Research shows that almost 75 percent of the television viewers would like the opportunity to use their remote controls to interact with their TV programs and advertising.Our dual faced keyboard remote provides the perfect solution and shows that sophistication and innovation can go hand in hand. 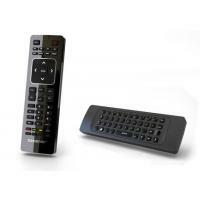 The product is a remote and a keyboard in one, with the top side featuring a remote control, and the bottom side featuring a keyboard. By simply turning the remote, a keyboard is available allowing text input as needed in media search, instant messaging and web browsing purposes. It comes with alternate input methods like pointing, touch-pad, or optical sensor, making browsing a better experience than the traditional 4-directional keys. Playing digital TV, games, browse web page, send email, anything you want on the screen. Conviniently use like remote control, and it combine the wireless mouse, wireless keyboards and remote control functions. Can use on digital TV, laptops and desktop computers in any corner of your room within 15 meters.